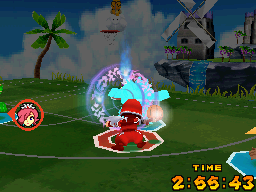 The Leaf Veil is Ninja's Special Shot in Mario Hoops 3-on-3. To perform it, the player must tap out the letter N twice. Ninja begins the shot by bouncing the ball to his left, then in a high arc to his right. The ball glows white throughout this part. Ninja returns the ball to the center and creates a purple energy disk. Four blue flames appear on the disk and surround the ball. Ninja shoots the now-blue ball toward the basket, disappears in a flash of leaves, and then reappears near the ball and slams it into the basket. If shot outside the 3-point line, instead of Ninja, a teammate needs to complete the dunk. This page was last edited on April 4, 2019, at 06:48.